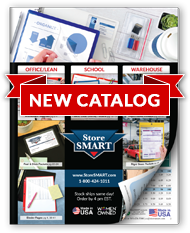 StoreSMART's FileSMART Tab Folders will certainly keep your paperwork neat—but they're also ideal for showing it off! With two crystal clear 8 ½" x 11" pockets on the front and back covers, your hard work will transition seamlessly throughout the office or classroom. Use the exterior pockets to house title pages or presentation outlines, and tuck your content inside to create effortless training packets, proposals, and personnel files. The best part? The 5 ½" file tab on the side lets you label each folder with the project or client name. Our FileSMART Tab Folders are constructed of 100% super polypropylene archival material to help protect your valuable documents, and unlike manila file folders, they won't tear, wilt, dog-ear, or discolor. A professional business or medical environment demands professional materials. Don't settle for anything less—choose a tab folder that can stand up to the toughest treatment, and come out looking as fresh as your ideas. 10-pack includes red, orange, yellow, green, metallic blue, metallic purple, navy blue, black, white, and silver. Our file tab folders are ideal for purchase orders. Place the order in the front cover, and additional information inside.